Twenty government officials are part of the National REDD+ Academy’s Training of Trainers currently underway in Nay Pyi Taw. The training is being conducted as part of the UN-REDD programme in Myanmar. REDD+ is a new mechanism that aims to create an incentive for developing countries to protect, better manage and wisely use their forest resources, contributing to the global fight against climate change. The National REDD+ Academy, which has been conducted in many other countries, trains participants about the principles of REDD+ implementation, so that they can play an appropriate role in further providing or delivering direct training extension to different REDD+ stakeholder groups in the country as needed. 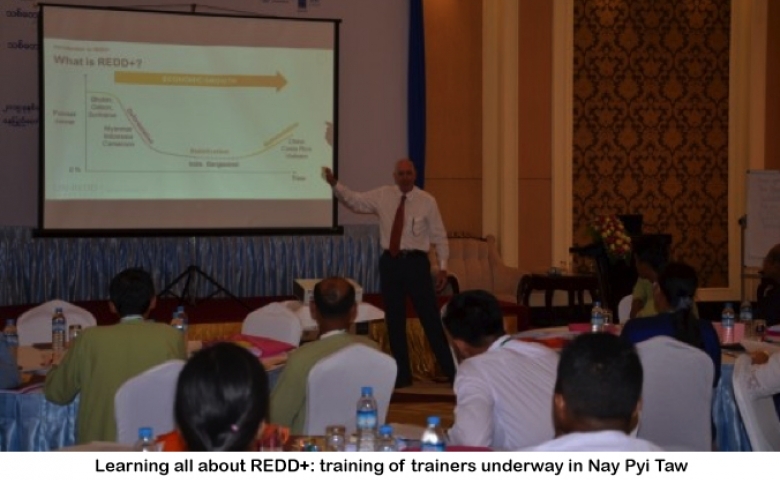 The training in Nay Pyi Taw will build understanding among key stakeholders on REDD+ implementation through a long-term and sustainable learning experience and which can be later adapted to constitute a training curriculum on REDD+ for Myanmar. “Environment challenges like deforestation and forest degradation, causing climate change and water pollution are major problems these days in Myanmar. Climate change is one of major issues in our age and for our people. We have no time to delay to fight against it and contribute to global climate change mitigation efforts,” said Dr Nyi Nyi Kyaw, Director General for Forest Department of the Ministry of Environmental Conservation and Forestry in Myanmar. “The UN-REDD Programme recognizes the need for capacity building in countries that are preparing to implement REDD+. We need to make sure that capacity building is reaching as many stakeholders as possible. And this is the concept of the REDD+ Academy,” said Mr Tim Boyle, Regional Technical Advisor for UN-REDD Programme. The National REDD+ Academy concludes tomorrow. With funding support from Norway’s Government through the UN-REDD Programme, the prioritized activities of the Myanmar REDD+ Roadmap have been developed since 2012. The Forestry Department of the Ministry of Environmental Conservation and Forestry is the Implementing partner of the UN-REDD Programme in Myanmar.